Explore the waters alongside the JBR Beach on the Lotus Mega Yacht. Admire the views of the Blue Water, the Palm Islands, Dubai Marina, and the Atlantis, while helping yourself to a delicious buffet dinner. Gorge on to the wide range of local and international cuisines starting from pasta to grills. Hop onboard the Lotus Mega Yacht and marvel at the Palm Islands and the Atlantis hotel. Pass by the Blue Water Island and the Dubai Marina, while sitting comfortably on the yacht. Satiate your inner foodie with a variety of delectable cuisines that are available on deck. Feel at home as you explore different entertainment options onboard or avail services by professional butlers. Cruise on the waters near JBR beach on the Lotus Mega Yacht as it takes you on a sightseeing tour. Bask in the views of the Palm Islands, three artificial islands on the coast of Dubai. Relax at the onboard swimming pool or unwind yourself at the Chill Lounge. The yacht also has a Kids Cinema to keep the kids entertained. Pass by the Blue Water Island, another manmade island on the JBR coastline. Try the plethora of local and international cuisines such as pasta, sushi, BBQ and roasts that are available at the buffet and live cooking stations. You can get details on the menu by clicking here. Admire the view of the Atlantis hotel and the Blue Water from the top deck, while sipping on the soft beverages. You can also avail services by professionals butlers who will make you feel comfortable with their hospitality. This Lotus Mega Yacht is a good way to explore some of the most famous tourist destinations in Dubai. Climb onboard enjoy the sightseeing and create memories that you would love to cherish. 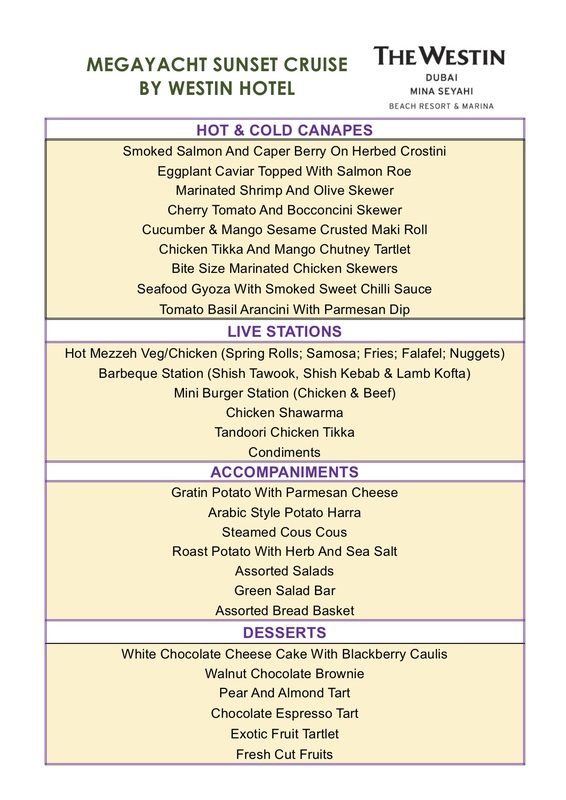 The dinner buffet cruise is available every day, between 08:30 PM and 10:30 PM.